There has been a steady stream of complaints about the new Facebook Ticker from Facebook users. Some of it focuses on revealing “private” activity while others are just annoyed that they are unable or unwilling to keep up with the information that flows through it. But as each day passes, Facebook users are becoming more and more accustomed to seeing this hyper-active roll on the right side. And as tends to be the case, more and more people enjoy using it — even if they won’t admit it. Unless you refuse to acknowledge the existence of the Ticker, chances are good that it has sucked you into a discussion that you would have otherwise never been involved with prior to its launch. It’s even possible you’ve became aware of a brand page as a result. If you run a brand page, you need to adjust. This can be huge for you. I’ve seen some complain that their numbers have dropped since the new roll-out. I think it’s a matter of knowing how to take advantage. It’s pretty simple. If someone likes your page, it goes into the ticker of their friends. If they post on your page’s wall or comment on one of your page’s posts, it goes into their friends’ tickers. I don’t think I need to explain what this means… But I will. You want people to post on your wall and comment on your posts. If you weren’t interactive before, you need to be now. Or suffer. When someone interacts with your Facebook page, that activity shows up in their friends' Tickers. To me, the Ticker simply magnifies the importance of interaction on brand pages. It was important before. But the Ticker widens the divide between those who interact and those who don’t. If you don’t interact, your page dies either way. If you do — and you do it well — your page could be more successful than you ever imagined. 1) Post photos and ask for a caption. 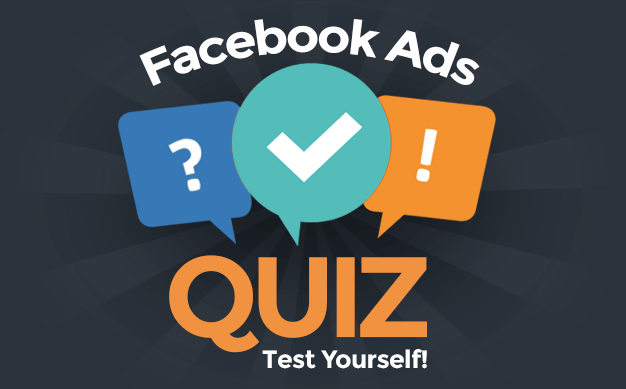 2) Use the Facebook Question app and poll people. 3) Whenever you post anything — link, photo, video — ask for a response. 4) Hold a Facebook Chat within a single post. I haven’t seen the fourth done before, but I think it could be very successful. I compare it to a Twitter hashtag chat. You set up a time to do it. Promote it regularly, maybe even with an “event.” Then use only one status update as the official “thread” of the discussion. That way, you don’t annoy those who already like your page with multiple posts. Will it annoy their friends? Not if you do it right. If people are commenting four or five times on your chat, that won’t add a number of updates to tickers that is out of the ordinary. But it will add enough that will get their friends’ attention. So be smart about it. 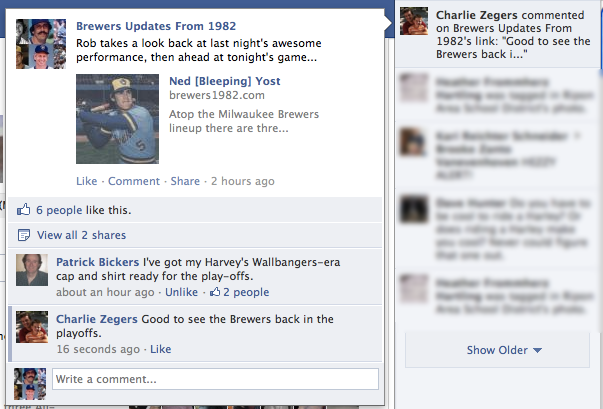 I am going to try this out with Brewers Updates From 1982. I plan to have a single “game thread” to run play-by-play highlights of a game from 1982 on the day and at the time it happened (reliving it). I’ll do it all within a single post, making updates as necessary. Then those following it can comment. I’ll let you know how it goes. These are all ways that you could have gotten your “fans” (or whatever they’re called now) to interact with your page before. But that was more about keeping them engaged. Now we’re looking to extend their engagement to their friends via the Ticker. 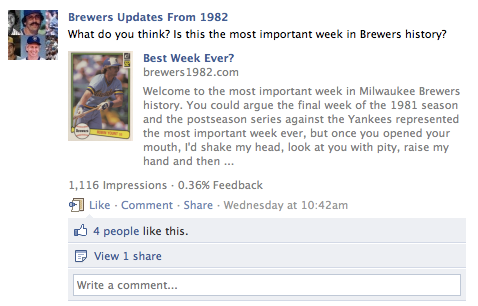 The result, hopefully: Increase brand awareness and the number of people interacting with your page. Facebook now notes how many times a page post has been shared and by whom. I really think this is big. Not only is it nice for me as a page owner to view who shared it and how many times it was shared, but it’s a good way to encourage others to do the same. We’re more likely to share if we see that others have done it. So if you run a small page, the first thing I’d always do after making a new post is to share it yourself. That way it’ll always show that it’s been shared at least once. What other ideas do you have do you have to take advantage of the Ticker? What have you done or seen others do that was successful?